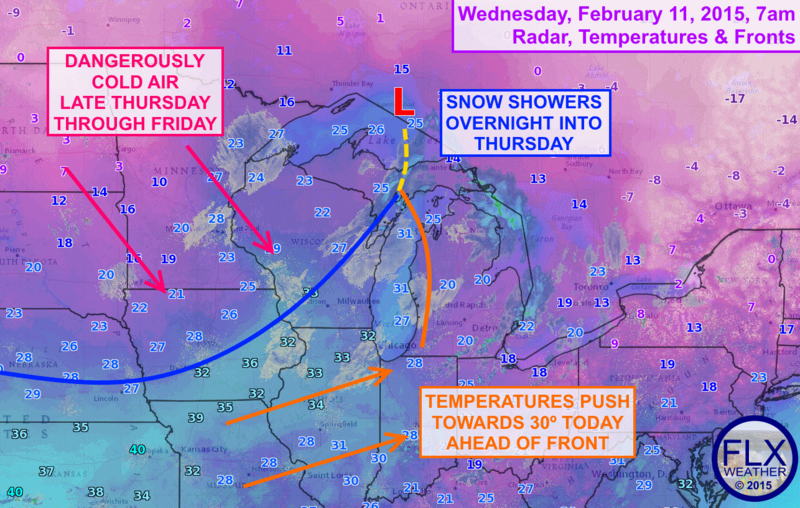 An arctic cold front will cross the Finger Lakes region on Thursday, ushering a stretch of cold air that will last through the weekend and could challenge even the coldest weather from last winter. Temperatures today will climb to near 30º- a near heat wave for the Finger Lakes. Enjoy it while it lasts.An arctic cold front is poised to cross the region during the day on Thursday. Ahead of the front, temperatures will climb from a cold start to highs near 30º. A little sun may even be possible this morning. Some snow showers will be possible as the front approaches, starting this evening and lingering into Thursday. Most areas will not see more than an inch or two, but some limited lake effect could bring a few areas a couple more inches through early Friday. Cold air will flood the region during the day on Thursday, with temperatures tumbling into the single digits and wind chills dropping below zero before the sun drops below the horizon. A Wind Chill Watch has been issued for all of western and central New York for Thursday night into Friday morning. Temperatures will be below zero at this time, with winds around 10mph, resulting in wind chills of -20º to -30º. Frostbite can occur in less than 30 minutes in these temperatures. High temperatures on Friday will be in the single digits, keeping wind chills below 0º all day long. Not to be outdone, another cold front will move through on Saturday, sending the temperature and wind chill down even further for Sunday into Monday. Temperatures will moderate slightly after that, but will remain below average.